CLICK HERE to view comprehensive charts of this guitar's sophisticated switching & knobs functions. Opens in new window you can shuttle back and forth between. A close inspection reveals all external parts are original. I anticipate that the internal parts are original and in similar condition as well, and I will check upon a Customer's request; (This guitar's exceptionally Excellent condition is a "don't touch anything unless requested" Industry Standard practice). Vibrato arm is missing. 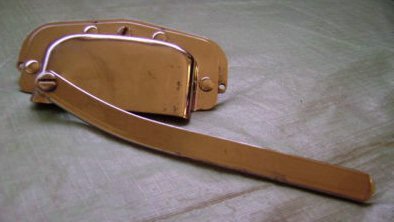 A very simple piece to make; It simply clamped onto the cover housing hole with nut, bolt and washers; The cover plate is attached directly to the swivel of the vibrato mechanism. See inset picture. Darker red horizontal wood-grain-looking lines and vertical diagonal white line in most of these pics are reflections from window venetian blinds. 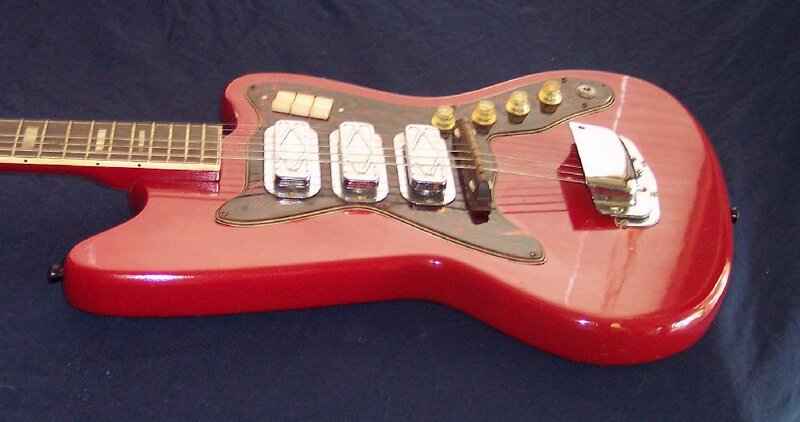 The red finish on this guitar is stone-cold opaque with no wood grain showing at all. Vibrato arm attaching hardware from top to bottom, for fabrication purposes: Machine screw, steel washer, vibrato arm, nylon or teflon washer, the machine screw through vibrato housing cover hole, steel washer, lock washer (for adjustable tension) and nut to adjust swing-away tension. Rocker switches should have their contacts cleaned and their axle lubricated. Pots should be cleaned and lubed with Cailube (TM) potentiometer cleaner / deoxider / lube. Jack sleeve should be cleaned out. All normal guitar care items should be done (tuners and vibrato lube, intonation and action set, guitar polished, hardware lubed lightly and wiped off, etc). I'll be delighted to do that if the Customer requests. (This guitar's exceptionally Excellent condition is a "don't touch anything unless requested" Industry Standard among professionals). 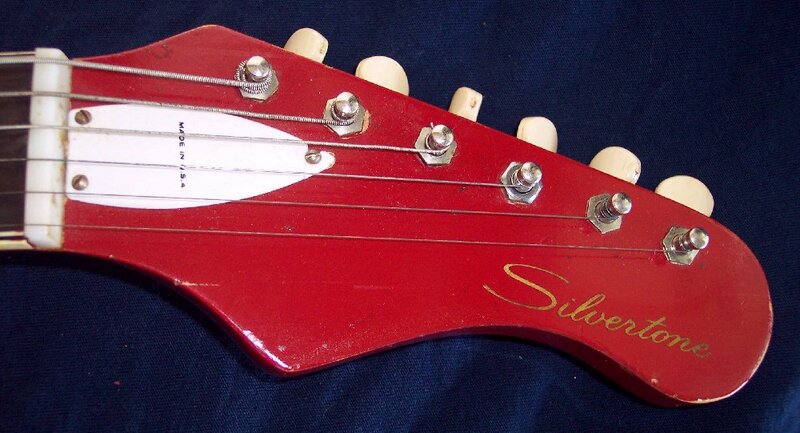 Ever see a Gold silkscreened logo on any other Silvertone ? !